Heat gas or charcoal grill. Cut 12 (10x10-inch) sheets of heavy-duty foil. In 1-quart saucepan, melt butter over medium heat. Add onion; cook, stirring frequently, until onion is tender. Stir in 1/3 cup cilantro and the bell pepper; cook 3 minutes, stirring constantly. Stir in lime juice and garlic salt. 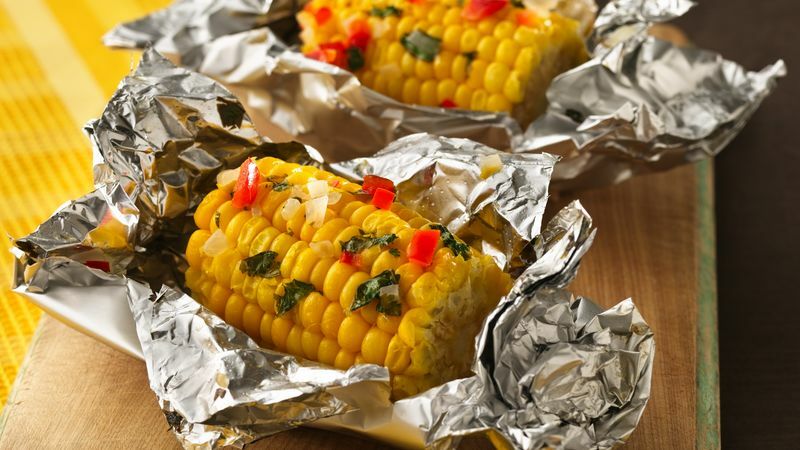 Place frozen ear of corn in center of each sheet of foil. Drizzle butter mixture evenly over corn. Fold foil over corn so edges meet. Seal edges, making tight 1/2-inch fold; fold again. Place corn on grill over medium heat. Cover grill; cook 25 to 35 minutes, turning occasionally, until thoroughly heated. Cut large X across top of each packet; fold back foil. Sprinkle with 1 tablespoon cilantro. Experiment with herbs from your garden to come up with a new taste every time. Try dill weed, rosemary or thyme. To Bake: Heat oven to 400°F. Line 13x9-inch pan with foil. Place frozen corn in pan. Pour butter mixture evenly over corn. Bake 25 to 35 minutes or until thoroughly heated.